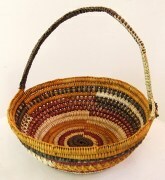 Australian Aboriginal baskets include hand-coiled and hand-dyed baskets made from the leaves of the pandanus plant and hand-made string dilly bags made from weaving hand-made string made from the bark of trees. The plant fibres are dyed in bright orange, yellow, red, black and purple by boiling in ground up roots of plants like Pogonolobus reticulatus and wood ash from Eucalyptus alba. Baskets are used for gathering bush foods including shellfish, roots, tubers, berries, honey and fish. Aboriginal baskets are hand crafted at each stage, the plant fibres are collected and prepared, the colours dyed from plant roots which are also hand gathered and the baskets woven. Each basket is beautiful, unique and skilfully crafted, representing traditional basket weaving techniques and many hours of work.